A 34-year-old man riding a motorcycle was killed after his vehicle collided with a tempo traveller on the Pathankot-Mandi national highway in Himachal Pradesh's Kangra district, police said Sunday. 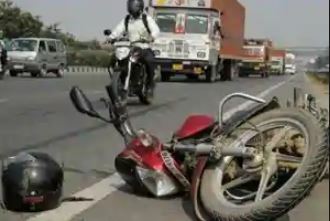 Shimla: A 34-year-old man riding a motorcycle was killed after his vehicle collided with a tempo traveller on the Pathankot-Mandi national highway in Himachal Pradesh's Kangra district, police said Sunday. The accident occurred on Saturday at the district's Ghatnalu village, police said. Manohar Lal was rushed to a civil hospital from where he was referred to Tanda Medical college where he succumbed to injuries, they said.